Fashion is a timeless form of art; often influenced by the world around us. In Africa, culture has always played a big role in how we interpreted fashion and what we deemed as our own style and trends. Our country is so rich in culture, which is a beautiful thing because these very customs and traditions we love and respect are what we associate with and what we use to influence our own sense of fashion. Today, our traditional regalia are turned into really dope fashion statements, and these trends are sometimes even adopted on the international fashion stage. One tribe that has played a major role in the South Africa’s fashion movement is the Ndebele tribe. You may have seen the newly trending gold Ndebele neck ring chokers. This has become the latest fashion accessory and is loved and worn by almost everyone. 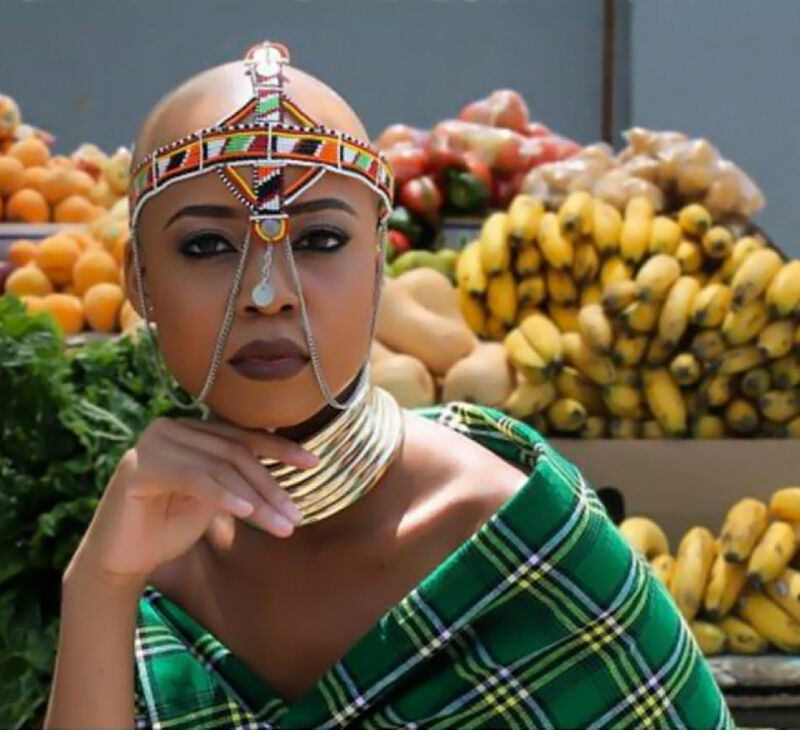 While we love that everyone is embracing their “African’ness” and appreciating who they are, we also know that some people are clueless on the stories that lie behind these fashion pieces. Instead of “blindly” wearing your choker for the sake of fashion, we took the liberty of finding out about its origins. The Ndebele people are part of the Nguni tribe and consist of two groups; the northern Ndebeles, who are the Zimbabwean Ndebeles, and the southern Ndebele tribe who are the South African located Ndebeles. In the southern Ndebele practice, the copper or brass neck rings are called “indzila” and are said to represent a myriad of things. The indzila was historically worn by married women, and only after they had been built a home by their husbands. Back in the day, the Ndebele wife would wear her indzila around her neck, arms and legs, as a symbol of her bond and faithfulness to her husband. The husband was responsible for providing the iindzila to his wife as a way of showcasing to the tribe, his wealth, and family status. The more rings a wife wore, the wealthier the husband was assumed to be. The rings were believed to have strong ritual powers and the woman would only be allowed to remove these after the death of her husband. It’s said that the rings aren’t painful to the wearer, but may at first be uncomfortable. Thankfully, wives no longer have to permanently wear iindzila. This is the beauty of our people, and of their customs. So, next time you wear your fashionable iindzila, remember where that swag comes. Do you own this fashion accessory? If so, how have you rocked it? The Ndebele people are a nation so we can’t reduce them to a simple tribe. They are also part of the collective of the Nguni clans so even then, “tribe” would be minimising them and other clans. Hi! My buddy has shared with me some fascinating news in the crypto currency field ! Several chaps in the cryptocurrency online community are publishing that a new cryptocurrency is being finalised and, it is being championed by the leading city law firms ! Allegedly, it is called LAWesome coin! It would be superb if anyone could share some new real-time info on this coin. I would unquestionably, like to get this coin and take part in the bounty hunt to earn some free coins also. Unfortunately, there is a shortage of intel on this coin as I feel that it is a being kept hush hush. I wonder what urged the law firms to come into the cryptocurrency area? This interesting move will definitely present the cryptocurrency much more reliability and confidence. I have been coming to your website for awhile now. I find that it is written well and well-researched. Keep up the great blogging! I have been coming to your website for awhile now. I find that it is informative and well thought through. Keep up the good blogging! Howdy would you mind letting me know which web host you’re using? I’ve loaded your blog in 3 different browsers and I must say this blog loads a lot quicker then most. Can you recommend a good hosting provider at a honest price? Thanks, I appreciate it! It is really a great and helpful piece of information. I’m happy that you just shared this helpful information with us. Please keep us up to date like this. Thank you for sharing. Your style is very unique compared to other folks I’ve read stuff from. I appreciate you for posting when you’ve got the opportunity, Guess I’ll just bookmark this site.